Virgin Australia has announced it is bringing forward first deliveries of the 23 Boeing 737 MAX 8s it has on order from 2019 to 2018 as part of efforts to increase aircraft fleet efficiency. However, the airline’s CEO John Borghetti won’t say when exactly the first aircraft, which were originally ordered in July 2012, will now be delivered. “I can give you a month range, but I won’t,” Borghetti said during the airline’s annual results press conference on Friday. “But how did we do this? I’ve got the best negotiator, and his fleet team, in the business. It’s thanks to their good work,” he said, pointing to chief financial officer Sankar Narayan. Virgin also used its results announcement to confirm it is retiring its original two Airbus A330-200s acquired second hand in 2011, the first of which, VH-XFA, left the fleet earlier this month. With the delivery of a final new-build A330-200 next month, that will mean a net reduction of the Virgin Australia A330 route by one unit to six. 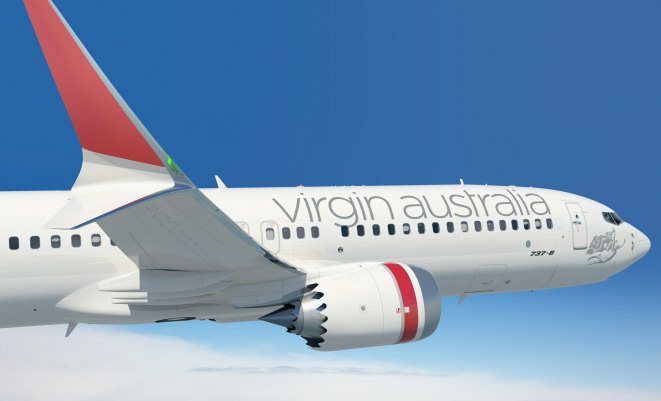 As a consequence, Virgin has previously announced it is replacing some of the A330 services on the Brisbane-Perth route with Boeing 737s and that it is also adding two extra 737 return services per week, resulting in more frequency on the route. Nonetheless, Borghetti hinted the redeployment of the 737 on Brisbane-Perth might be an interim movement, suggesting they will operate on the route “for the moment”. As for longer-term widebody fleet plans, Borghetti stressed that Virgin Australia is in “no rush” to make a decision on new types such as the Airbus A350 and Boeing 787, but he did note that “they’re both excellent aeroplanes”. Virgin to put business class on the trans-Tasman, new premium product to come? Wow ! , ” I’ve got the best negotiator , and his team , in the business . It’s thanks to their good work ” says the CEO . This is clearly seeing your employees as an asset and not a cost . Other businesses out there are free to follow if they wish .I wouldn’t be surprised of future Virgin successes .I wish I could work there . It is a shame other staff who work until they almost drop aren’t complimented the same way. I have watched ground staff and cabin staff handling the most undesirable people whilst being abused and sworn at. The people working with the public – in my opinion deserve a huge pay rise for having to cope with what they do.